RIM hasn't released BlackBerry 10 yet but the company's CEO revealed Thursday the operating system almost didn't get the go-ahead. 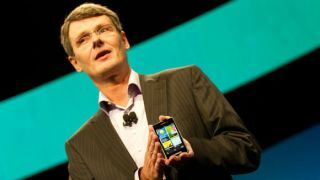 Thorsten Heins, the beleaguered boss of the suffering RIM, told the Telegraph the company nearly went with Android before ultimately deciding to move forward with BB 10. "We took the conscious decision not to go Android," he told the paper. "We looked at it seriously - but if you understand what the promise of BlackBerry is to its user base it's all about getting stuff done." Heins went on to say his company wants to remain true to its purpose and will - for now - continue to build with that in mind, including pushing out BlackBerry 10. Heins conceded in the same interview RIM can't keep up with top dogs Apple and Samsung unless it gets help from the outside. And while Android vendors HTC and Motorola have hit hard times, thus making RIM's decision to ditch Android at the door seem like a good one, BlackBerry 10 needs to deliver in order to keep the company afloat. TechRadar reported the first BB 10 devices should hit the market in January. Thanks to an early peek at the OS, we learned BB 10 introduces an entirely new user interface, creating something that looks more like Android and iOS yet with its own personal twists. For RIM's sake, here's hoping BlackBerry 10 hits its mark.